Manufactured from an innovative nitrile compound, the Ansell TouchNTuff 92-665 Chemical-Resistant Disposable Nitrile Gloves offer excellent dexterity and chemical resistance, with superior durability and comfort to similar latex and PVC gloves. With textured fingertips for improved grip in wet and dry conditions and a rolled cuff that provides protection to the wrist, these gloves are suitable for a wide range of applications in the automotive, chemical, construction, electronics, food and pharmaceutical industries. The TouchNTuff 92-665 Chemical-Resistant Gloves have been tested in accordance with EU standard EN 374 - 1, and EN 374-5, and are certified for protection against virus and contact with a number of chemicals (Type B). 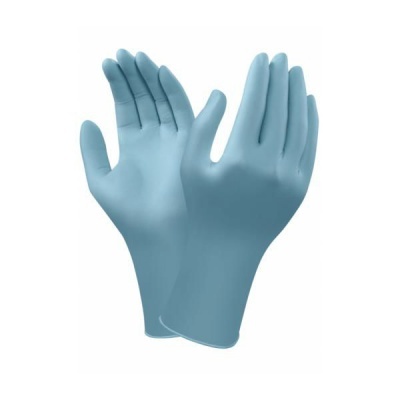 The TouchNTuff 92-665 Nitrile Gloves are available in a range of sizes. Please measure the circumference of your hand around the knuckles (excluding the thumb) with your hand open and your fingers together, and the length of your hand from the tip of your middle finger to your wrist.